I play the bass and I teach others how to play the bass. Produced and taught clinics on "Jazz History", "Emotions In Music", "Jazz Improvisation" and "Bass Master Classes"
Jezz, let's see I guess I'll start at the beginning. I was born in Hershey, Pennsylvania the town of Chocolate. I had great supporting parents and a great brother and sister. My earliest memories were making instruments out of discarded cardboard tubes and banging on these to make sounds. One summer I worked on our family farm and other odd jobs to save enough money ($25.00, I think) to buy a drum set. I had no clue how to play these but had a ball banging on it and driving the rest of the household insane. Every Saturday night I would watch the Lawrence Welk Show in anticipation of jazz clarinetist Pete Fountain doing his little segment on the show. I organized a little jazz band with the neighborhood kids and was amazed that our music sounded nothing like Pete Fountain on the Lawrence Welk show. During this same period my Dad would take my brother and me to Hershey Park for the free Sunday evening concerts. The concerts ranged from concert bands to acts like guitarist Les Paul and Mary Ford and later some of the R&B bands of the day. My biggest influence around this time was my uncle, Frank DiNunzio. Uncle Frank was a bass player, had his own band, owned a supper club (The Green Terrace) and also played bass with Reg Kehoe and His Marimba Queens (do a search on you tube for Reg Kehoe and his Marimba Queens) That's uncle Frank playing or fooling around on the bass. He was a great showman and very funny guy. I worked at his restaurant The Green Terrace (one of my only "day gigs") as a bus boy to save enough money to buy my first electric guitar. My friends Mike Langerio, Barry Brosey and I got together and started jamming on my back porch. Three guitar players plugged into one small amplifier. We decided to form a band but we needed a bass player so I volunteered. Puff, I'm a bass player. 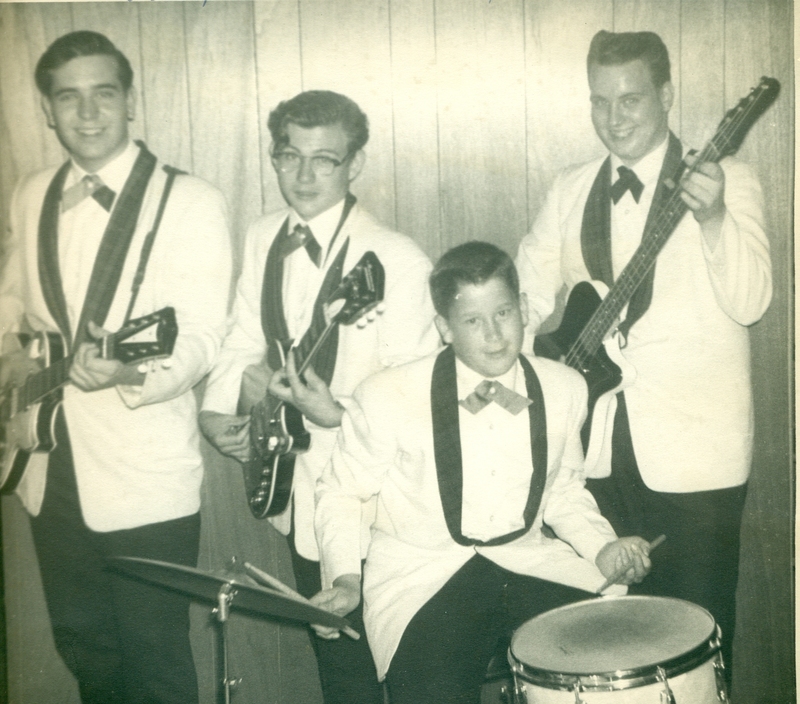 I bought a Sears Silvertone bass and amp and we formed the band "James Luke and the Prophets"adding organist Tom Bross and drummer Bill Spahr and later my second cousin Dave Bob played drums. We played cover songs from all the hot groups and played all the teen dances throughout Central Pennsylvania. Mike and I hung every day during our teenage years and most every day Barry joined us. Mike enlisted in the Marine Corps and was killed in action in Vietnam at the age of 19. 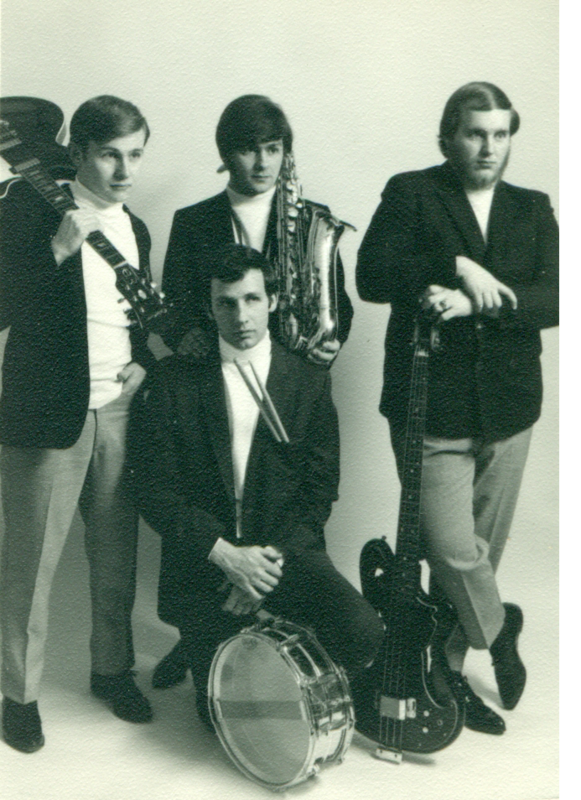 Barry and I joined the band "Lou Adams and the Reasons" along with drummer Kenny Bachman. Later Tom "Thin" Albert replaced Kenny Bachman on drums and the band became "The" which had two gigs before disbanding. Lou was an incredible guitarist and singer and we were doing our own versions of rock classics. Lou was a few years older than the rest of the guys in the band and told us stories about playing music on the road. Hearing his road stories convinced me that this was the life for me. I even managed to drag Barry along in a few of the road bands. Lou was way ahead of the times and ending up drinking himself to death at an early age. After graduating from Hershey High School I went on the road with "Bob Garber and the Spotlight Review". It was a four piece band, two exotic dancers and Bob Garber a comedian. We did one night shows throughout the United States mostly at military bases, high end private clubs, as well as Elks and Moose clubs. What a great way to grow up. We spent most days traveling to the next gig, unpacking and setting up the equipment, doing the show, packing up the gear and hitting the road again. The guys in this band turned me on to modern jazz and I bought my first jazz album "A Love Supreme" by John Coltrane in a little record shop in a small town in Georgia. Bob Garber wrote a book about this road show entitled "Two Million Miles" The Real Show Business Story (e book ISBN 1-4140-2118-6 Paperback 1-4140-2117-8) I did this gig for a few years and then joined a band out of Baltimore, Maryland called Danny O'Day and the Day Tripper (originally The Upsetters) which were the white band that backed Otis Redding when he could not use his African American band in WHITE establishments. We played a lot in the New England area and worked in Boston in the "combat zone" at the Intermission Lounge backing Roger Pace a white James Brown type entertainer. With the remnants of this band we started the "Ladies Home Companion" traveling all over the US playing in night clubs. During this period most every town and city in the United States had at least one night club that hired touring bands. We worked out of a talent agency in Philadelphia called Jolly Joyce Agency with Norman Joyce booking the bands in various clubs. He kept us working although some jobs were draining like in Atlantic City (before the casinos) where you worked alternating with another band from 10:00 PM to 6:00 AM seven days a week. By this time I was really getting tired of traveling and decided to head home to Hershey. Up until this point I was relatively ignorant about music and playing the bass since I played mostly by ear. I was bitten by the jazz bug and I could not advance any father without assistance. 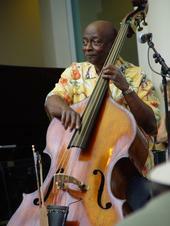 There were no teachers for jazz and very few bass teachers in the area. Harrisburg, Pennsylvania about 13 miles west of Hershey was a relative hot bed of jazz. John Brown, the alto saxophonist and straw boss in Dizzy Gillespie's band was from Harrisburg and he taught many of the African-American musicians in town. He returned to Harrisburg and I phoned Mr. Brown and asked for instruction. By this time he was very ill and refused my request because of his health and passed away a short time later. At this point I had acquired an upright bass and was trying to play along with the jazz recordings I had but this proved difficult. I finally started taking lessons from Ray Miller (no relation) a local school teacher and bassist. We worked mainly on Simandl (classical technique) and not much jazz. Ray had me join the Hershey Symphony Orchestra and later I did a few gigs with the Harrisburg Symphony. Although I like classical music it never spoke to me like jazz so my time playing that music was limited. During this time I met Ron Waters who had the group Latent Image. This was the first real jazz group that I played in. Ron did all the arrangements and played trumpet, Jimmy Wood on piano, Jess Avery played tenor sax and Sammy "Pops" Banks was the drummer. This was a thrilling band with guys playing way over my head and me trying to keep up. I was also a member of the "New Jazz Quartet" with Wayne Fox, piano; Tom "Thin" Albert on drums and my future partner and best friend Tom Strohman on woodwinds.I was practicing the double bass about 9 or 10 hours a day plus studying chord construction and theory on my own every evening. Finally after about three years of bass lessons Ray Miller said he took me as far as he could and I'd have to find a new bass teacher. There still wasn't a bass teacher in the area so I was kind of at the end of the road. I started having jazz jam sessions in my garage and invited a bunch of musicians. Tom Strohman was usually there along with trombonist Lee Robertson, drummer Rick Kline and a host of other players.Lee wrote most of the original music for the jam session and we played some pretty experimental music in those sessions. Lee went off to the Air Force and played in the Airmen of Note. After his discharge from the Air Force he went to New York and was the soloist in the Thad Jones/Mel Lewis Big Band and later with the rock band King Creole and the Coconuts. A few of the guys from the garage band got a few gigs but didn't have a name for the band so we called ourselves Muskmelon for the first couple of jobs. The jobs went well and we were a band. We needed a better name so one night after a gig at 3:00 AM sitting in an all night diner we were down to three names. Third Stream won mainly because we all wanted to get home. 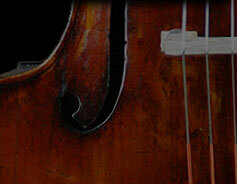 Third Stream music is the fusion of jazz and classical music. That is not what we meant by Third Stream, we were thinking of three small bodies of water joining together to create a major stream or force. 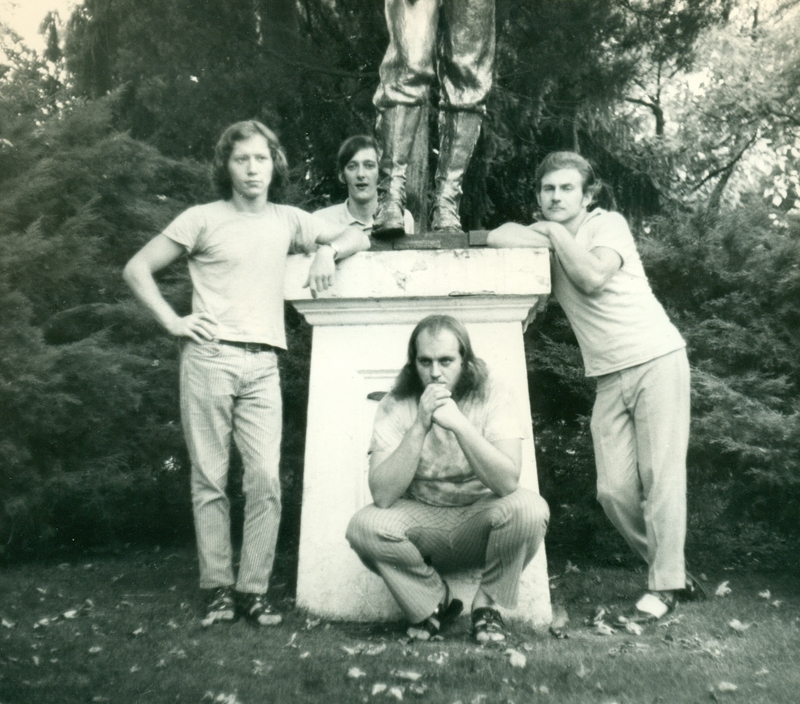 The first members of Third Stream were Rick Kline, drums; Bruce "Doc" Whitcomb on guitar and keyboard; Tom Strohman played woodwinds and keyboard and me on bass. Our philosophy was to play the music we loved and make it entertaining for our audience. This is the same philosophy that we have today. We were the opening act for Herbie Hancock, twice (once with Jaco Pastorius), Deodato, Stanley Turrentine, and others. We played night clubs, concerts, gave clinics and performed at wedding receptions and corporate affairs in the surrounding area. Rick left the band and moved to California where he got into post production in the film industry. Bruce went to New York where he opens a recording studio. The next version of the band had Phil DeAngelis on guitar and Tom "Thin" Albert on drums. This band recorded the 45 rpm record "In A Galaxy Far Away" written by Albert and "In Remembrance" by Tom Strohman. The two Toms wrote all of the music for our first album "Gettin' It Together". Phil left the band and became successful in the real estate business. Tom Albert moved on to compose and play drums in a road band. There was one other guitarist with the band before our current lineup. Mike Child played guitar with us and we have no idea what happened to him. Hope you are doing well Mike. So Jim Easton joined us on guitar and John Peifer plays drums. This band has been together for almost 30 years. Since the beginning of the band we recorded the 45 rpm "In A Galaxy Far Away" and "In Remembrance" the albums "Gettin' It Together", "Just Friends" and Just Friends Again" (two albums featuring our musician friends from Central Pennsylvania) "We Free Kings" (a Christmas cassette tape) and the compact discs "Black Widow" and "We Free Kings II" and one still untitled coming out in late fall 2011. I was still in need of bass instruction with no teacher in sight. One day I noticed an ad in a jazz magazine for the "Arthur Davis System of Double Bass" a bass book written by world renowned bassist Arthur Davis. I purchased the book which is a revolutionary approach to playing the double bass and I realized that I would need help getting this down. Art was originally from Harrisburg but left the area to play with Max Roach while he was a young man. I never heard Art play while he was living here but all the guys in Latent Image kept talking about Art Davis. As I got into playing the area jazz clubs I kept hearing stories about Art Davis and what a monster player he is. After doing some research on Art I knew he was the teacher I was looking for. It was not easy getting Art's contact info but he did a concert in Reading, PA with the Dave Stahl Big Band so I called Dave and he gave me Art's phone number. When I phoned Art he said I could come up to his home in Peekskill, New York to audition to see if he would accept me as a student. I set up a day and time for my audition and I was off to New York. I was really nervous about the audition but after about an hour of playing he said he would accept me as his student. Most of Art's other students at the time were top bassists in New York City. Art was very formal at the lessons with half the lesson being classical and half the lesson devoted to jazz. After a year or so of going to Peekskill, New York every week and practicing about 15 hours a day between lessons Art began to lengthen my one hour lesson to three or four hours and we really started to get into some music. I began staying overnight at his home and his wife Gladys would cook us a great meal and after dinner Art would tell me stories about all my jazz heroes that he played with until the wee hours. We become good friends with him bringing his family to Hershey every summer for vacation and his family taking me to the Culinary Institute in Hyde Park, New York once a year for dinner. A treat I'll never forget. He was a great friend and we had many laughs but when my lesson started he was all business. His wife Gladys who was a nurse supervisor at a VA hospital in New York got a job offer in California and they moved to Costa Mesa, California. I visited once and took a lesson but by this time Gladys fell ill and passed away a short time later. Art stayed in California and taught at The University of California, Irvine and Orange Coast College near his home in Costa Mesa. He traveled to the East Coast to play with various people and would stop by and stay at our home. On his last east coast performance he asked to use my bass for a concert that he and saxophonist Odean Pope were doing at the University of Pennsylvania in Philadelphia. I drove to Philly with my bass and we had dinner in China Town and then went to the concert. It was a concert dedicated to the music of John Coltrane who Art had worked with in the 1960's. The concert was just bass and tenor saxophone and I was memorized by the sounds Odean and Art were pulling out of their instruments. After the concert I was packing up my bass for the drive home to Harrisburg when this college age young man asked Art a question about the book. Art said," if you need help contact Jim since he was the student that studied longest on my method and since I'm on the west coast Jim is the person you need to see". I was honored that he thought I was ready to go forward with his vision. Art and I talked frequently on the phone but the Philadelphia gig was the last time I'd see him. I had called him prior to my leaving for vacation to see friends in Maine but he wasn't there so I left a message. Upon returning home there was a message from Art saying he was doing a recording session in St. Louis and just returned home. I got home from Maine and had to get to a gig so I thought that I would call Art the next day. I had this nagging feeling that I should call now so I did. We talked for about one and a half hours and he told me about the session and new research he was doing for his book on jazz history and other things. That was on Saturday July 28, 2007. He died the next morning Sunday, July 29, 2007 of a massive heart attack while taking his bass out of his car at home. What a drag... I really loved Art and thank him so much for being a mentor and friend. The death of Art Davis affected me greatly but I'm trying with the help of some of my students and Art's son Kimaili Davis to keep his name alive. I vowed that someday if I learned how to play the bass and understand the making of music that I would teach in the central Pennsylvania area so other people wanting to learn the bass would have an instructor in this area. I started teaching about 30 years ago in my home and in 1989 started as bass instructor at Lebanon Valley College in Annville, Pennsylvania. I retired this year (2011) from the college to concentrate on my students here at home and to pursue more performance opportunities.